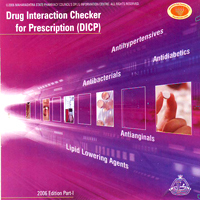 MSPC’s DIC have created its own indigenous CD based interactive software called as Drug Interaction Checker for Prescription (DICP) to detect Drug-Drug Interactions. Thus any adverse Drug Reactions can be nipped in bud in the first place. The DICP- I comprises of five drug classes viz. Available at MSPC's DIC office. Based on similar lines to DICP-I, previously launched by MSPC’s DIC comprising of five different therapeutic systems, DICP-II is ready to launch and soon will be available for all. DICP-II will detect Drug-Drug Interactions in any given prescription for treatment of HIV, TB or viral infections. Pharmacist working in ART/DOT’s or any other appropriate centers can check the prescription for any major interactions too.